Patient engagement is the new mantra. Several posts on 21st Century Patients blog have addressed this phrase and the confusion surrounding the term. Likewise, there are can be no defined outcomes for “engagement”. Although a meaningless phrase it is here to stay – subject to various interpretations and possibly used as a weapon for someone’s benefit. I suggest we step back a moment and really look at our clinical care areas for the presence of “engagement”. What do you see? Where are the eyes and ears? Perhaps you can identify with the scene in the Emergency Department of this story in the Washington Post, “Hit by a car, an emergency doctor experiences firsthand the shortcoming in ER care”. When an experienced emergency medicine “doc” becomes a patient after being hit by a car the reality of what it means to be a patient comes home. Patient engagement? No one listened, worse…no one even asked key questions (no H&P) for more than two days. This is a story of disengagement. This is not a solo episode. Our reliance on processes, reports, and monitor screens are becoming the death of care in healthcare. A recent post by John Mandorola MD speaks clearly to what is being lost in the patient clinician connection because technology has become king. 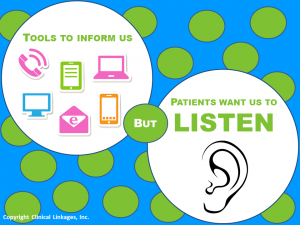 Digital is the focus, the center of our work….not patients. Sad, isn’t it? Very bright folks who pursue medicine and nursing have become slaves to tools intended to improve the way we provide care. Culture of care has become digital. 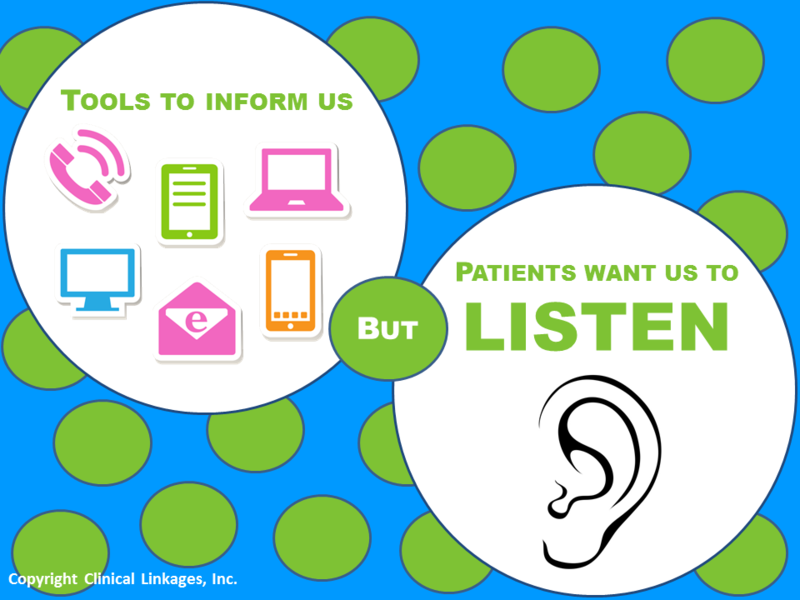 This means our eyes are on screens, not necessarily on patients. It’s all in the data today. 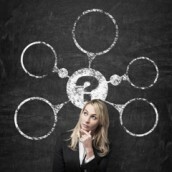 Data is very important and should be used as designed, to inform the user not dominate the thinking. These wonderful technologies are tools to better patient care. They are tools in a very expensive “toolbox”. The scans, the labs, the strips provide pieces of the story. But they are not the story, the story belongs to the patient. If we are paying attention we recognize the patients’ stories are getting out. These stories circulate on the many social media sites, they are told in community meetings, and of course the lay press is highlighting some of the most dramatic. When we look at sites like the Walking Gallery and see the jackets painted with thousands of patients’ stories we get a glimpse of the depth of the disconnects within our organizations, within our clinical practices. Is the heart of care today in the toolbox or in the clinician-patient relationship?